Please make sure that you remember to bring along a copy of your e-ticket or have your confirmation e-mail open on your phone or tablet so that we can make sure your entrance into the festival is a smooth as possible. Tickets are non-refundable and non-transferable to other festival dates. If you are no longer able to make it we are very happy for you to pass your ticket on, please just give them your e-ticket so that they can enter the festival. At 12.00pm- you are welcome to arrive before, but we will kindly ask you to wait by your car in the parking field until we are ready to open the festival area. Our independent security team will be carrying out bag searches at the ticket desk upon entry; your safety is our prime concern. Parking arrangements are different at each festival, however due to the volume of guests expected, only HOTEL RESIDENTS will be able to park in our hotel car parks. All Festival Ticket holders will park in our festival car parks. DISABLED PARKING will be offered upon request. Further Car Parking information will be released in spring 2019. 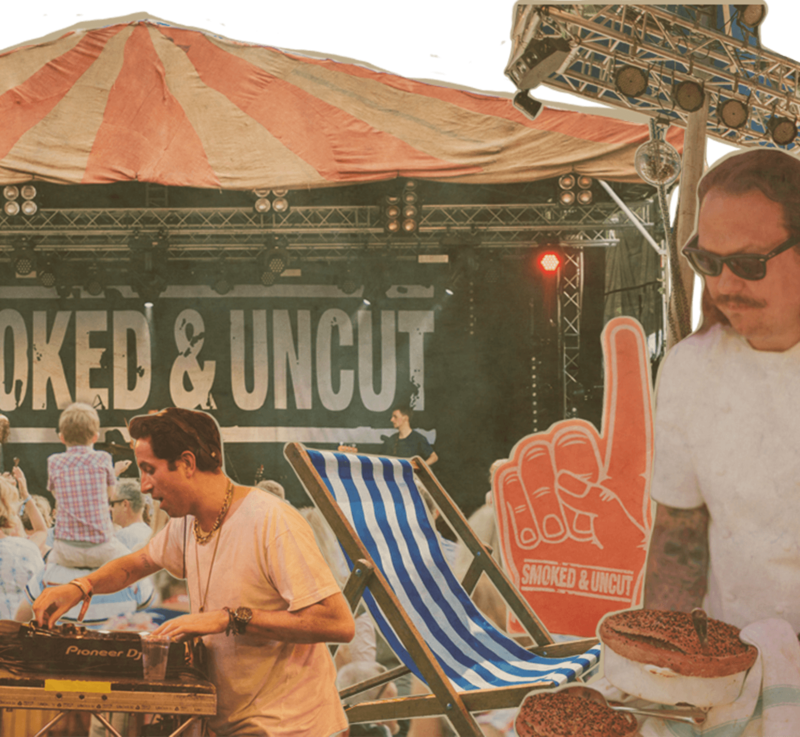 Camping is NOT permitted at any of the Smoked & Uncut Festivals. The festivals run from 12.00pm-11.00pm. Festival attendees will not be allowed to stay on the site once the festival has ended each day. If you would like to make a weekend of it you can book a room with the hotels directly or choose the Glamping ticket packages at Lime Wood and THE PIG-near Bath. We will have a wide selection of festival food available throughout the events, all to be washed down with something from our numerous bars! Soft drinks and bottled water will be available from our re-hydration station. We kindly ask that people do NOT bring their own food and drink for the day, all items must be purchased on site. As well as the Festival-Food stalls, there will be options for seated feasting at each festival. Tickets for seated feasting will be available from each festival’s ticket shop after release in spring 2019. Seated Feasting tickets MUST BE purchased IN ADDITION to a Festival Entrance ticket. Festival Go-ers will only be able to access the festival site with an Entrance Ticket. Children 0-4 Go Free but they will still need a Kid’s 0-5 Entrance Ticket to enter the festival site. Children 5-15 will need to purchase a Kid's Ticket (£20) to enter the festival site. Ages 16 and up will need an Adult Festival Entrance Ticket (£39.50) to enter the festival site. There will be a Kids Area to play in, but we do ask that children are supervised at all times. We operate a No Dogs policy across all Smoked & Uncut festivals. Straw bales will be placed around the area but these will be limited. Please feel free to bring rugs, blankets, pop up chairs etc to make yourselves comfortable. If it is looking like a wet day, there will be some very limited cover available under tents and we will have plastic ponchos available for you to use…..but you might want to bring some wet weather gear and an umbrella just in case! You are welcome to bring your own pop up gazebos/covers, but we ask for these to be placed at the back of the seating areas so that they do not obstruct the view for others. (available at Lime Wood and THE PIG-near Bath). Glamping tickets (£950) admit two people, with full details of the package explained HERE The Glamping Village will be situated a short walk from main festival site and access is from Friday afternoon. Tickets are purchased with a deposit online, once the £50 deposit has been paid, Glampers will be contacted by the Reservations team of the festival hosting hotel to make final payment. Full festival information and details of the weekend will be sent to Glamping guests prior to arrival. Glamping is strictly adults only and no dogs are allowed.